I have been a fan of the Flexeel hoses from Coilhose since the first day I started using them. They were a huge step up in hose technology; improving the hose in just about every way possible. Now comes along the Flexzilla hose line from Legacy to show that it wants to be the next big thing in hose tech. With a name like Flexzilla the hose better deliver some amazing features. Legacy claims their Flexzilla hose has zero memory allowing it to lay flat even in the most extreme weather conditions. I like the sound of this, a flat hose is a safe easy to manage hose. Flexibility is very important and the hose has been rated to be flexible at temperatures between -40° to 150° F (I would call this extreme). This is all made possible by using a “Premium Hybrid Polymer” material to construct the hose. Couple all that flexibility with a 300 PSI rating, and it looks like we have a winner. 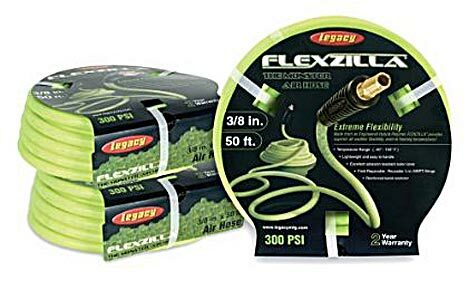 The Flexzilla hose comes in 1/4 inch, 3/8 inch, and 1/2 inch diameters ranging in lengths from 25 feet up to 100 feet. The price is similar to the Flexeel hoses at around $30 for 1/4”x50'.